What better way to enjoy the beautiful skylines and sandy beaches of Barcelona than to see it all from a Catamaran Cruise in Barcelona. The experience is one of enjoyment and relaxation as you sail on the Mediterranean. 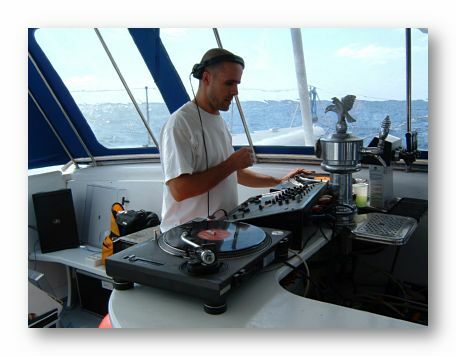 Aboard the boat you will be hosted by a crew providing you with fantastic service and drinks. 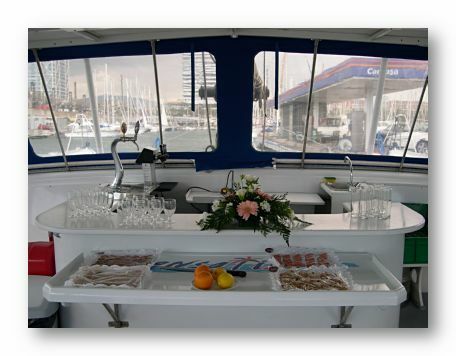 Start the experience at the Port Olimpic on a state-of-the-art catamaran which can fit up to 80 people. All the safety requirements will be gone over before embarking, making sure you are fully comfortable with this exciting and breathtaking activity. Sail on the blue Mediterranean Sea as you take in the picturesque skyline and coastline. 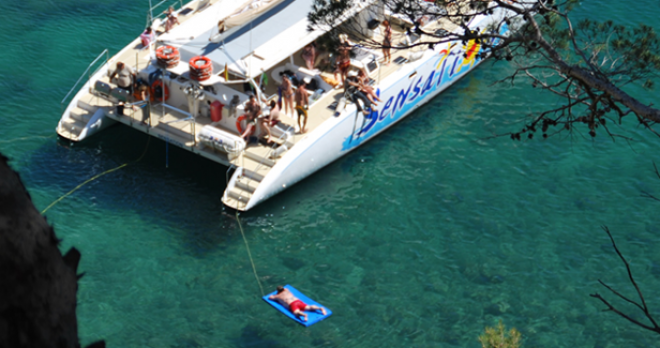 While you’re in Barcelona, make the most of the Sea, sunbathe over a refreshing drink of Sangria. This experience will complete your trip to Barcelona and will leave you with an unforgettable experience. You will be coming back for more. There are different times at which you can go, either option is a good one as they will allow you to take in different experience and sensations. Morning cruises are a great way to start the day, with the crisp, fresh gently caressing your cheeks and the smell of the sea awakening your senses. The lunchtime cruise offers similar emotions but with the added bonus of lunch on the boat! The catering team offers meat and vegetarian dishes with fantastic service. 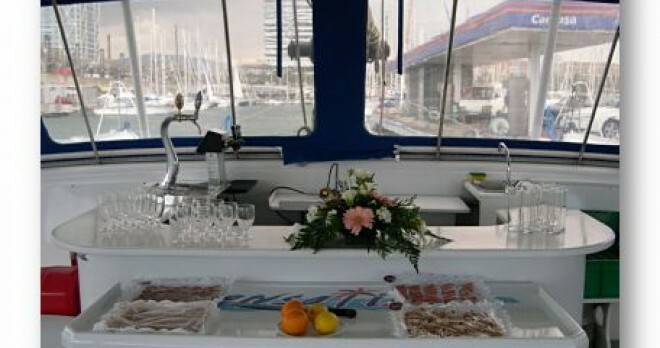 The Catamaran Cruise in Barcelona activity will start at the Olimpic Port, and will last a total of 3 hours. You will board a catamaran cruise which can fit up to 80 people. You will be introduced to the world of sailing with a briefing. And the journey begins. As you sail out of the port into the Mediterranean Sea, you can take in the stunning coastline and see some of the most significant landmarks like the Maremagnum. 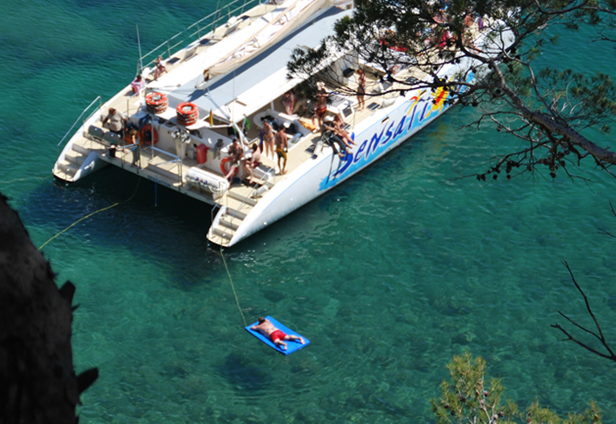 After an hour out at sea, the boat will anchor and you will get the opportunity to dive in for a swim. 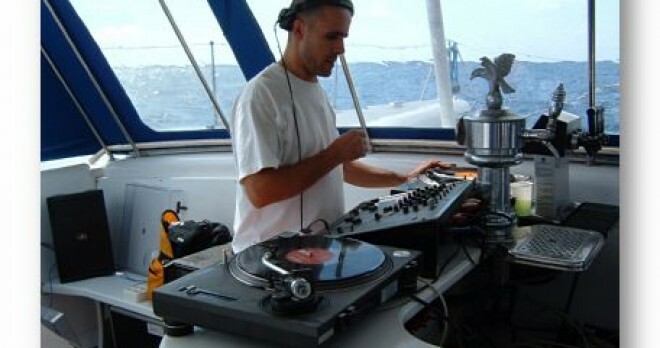 This activity is perfect for any occasion, you cannot come to Barcelona and not go out to see with some great music, drinks, food and the turquoise water surrounding you.